Mindfulness in nature – We all know how good being in nature can make us feel, whether it’s a walk in our local park or going deeper into the forest and removing ourselves from the constant noise and pollution of our cities. The natural sounds and smell emanating from the trees, plants and earth, the natural sunlight playing on the leaves and the pure peace and stillness of the landscape seem to touch something deep within us. It calls to something forgotten, bringing about a sense of ease, calm and deep relaxation. 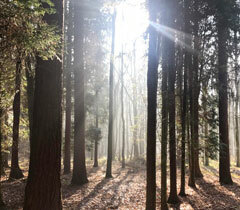 Mindful Practice in Nature – Mindfully walk into the forest. Don’t aim to reach a destination, simply place one foot after the other upon the earth, which sustains all life. Step by step, breath by breath continue between the trees, pausing when moved to do so. Become still, listen for a while to the natural sounds and to the quiet beneath them. No expectations, no anticipation, continue on, slowing your pace, breathing in the fragrance of the forest, the scent of the trees. Pause now and again to place your hands upon the bark of a tree or the damp mossy ground. Dip your fingers or toes into cool water streams. This is a guided mindful walk into nature. As we make our way towards the Heath/Forest we can share conversation and question. We will pause at the threshold to set our intention to simply be present in this natural world and walk mindfully in silence for a while towards a resting spot. Here we will find our own sit spot, stand against a tree or lie down and give our attention to noticing, through our senses our connection to the forest. We will then come together to be guided in a mindful breathing meditation. The session will conclude with Tea and an opportunity to share a short inspiring piece of nature writing if you wish to do so. Finding a place to sit and rest we absorb the flavours of the forest into our being, bringing its calm and truth into our awareness. The tree cannot be anything other than a tree. It’s not trying to impress us, it’s simply being itself. We are not so different from the trees. We too are nourished by the fruits of the soil, by the sun and the rain. Feel your own truth here in the forest. Try this – bring your attention to your feet against the ground. As you breathe in, feel your breath being drawn in from the earth through the soles of your feet. Feel it rise up through your whole body to the crown of your head. Within this breath is the sun and the moon, the rain and the many natural nutrients that also nourish the trees and the plants. Feel your whole being smiling with happiness before slowly releasing your breath back to the earth. If we can experience the wonderful healing power in nature and once more feel our connection to the earth and everything on it, we will come to love her dearly as our own mother. We will understand better how to care tenderly for her just as she has for us, so she can continue to do so for generations to come.